Crowdfund An A-To-Z Of Dungeon Monsters, Robot Western Comics, And More! A customisable index of monsters for tabletop RPGs and a cool sci-fi western comic series lead the charge on this week's look at all things crowdfunded, but that's not all there is - Detective tales set in a Lovecraftian universe, family friendly games about colonising Mars, and short fiction anthologies await! Set in the mid-1940s, Case File: Arkham follows Hank Flynn, a down on his luck private eye who is back from the war and now working the mean streets of the most cursed city on Earth—Arkham, Massachusetts. And things only get worse for Flynn when a wealthy uptown socialite hires him to track down an artist by the name of Pickman. What begins as a simple missing persons case leads Flynn down a dark path of flesh eating ghouls, vengeful witches, and the notorious Innsmouth mafia. A $10 pledge will get you a PDF of the comic, as well as some digital bonuses like wallpapers and what have you, while $15 gets you the physical edition. Of course, Pangaea broke up a long time ago, and because it did, mankind developed in drastically different climes and circumstances. But what if we twenty-first century types were living in one of the super-continental periods—those characterized by "lid tectonics" rather than "plate tectonics?" What would it be like if all of humanity was confined to a single landmass...and had been so confined for all of our recorded history? $8 nets you a copy of the collection in an e-pub format for tablets and e-readers, while $25 gets you a physical trade paperback. Other tiers include bonus books from some of the collection's authors. Mission to Mars 2049 is a family board game that is set in the near future. In this game you are in control of a human colony settled on Mars, and your objective is to build a water extraction station on top of the Martian Polar Ice Cap before any other player does. In order to do that, you will need to have a strategy for acquiring resources and building your colony faster than anyone else. The game is already funded, but while the project is still open, you can pledge 19 euros can net you a copy of the board game. Two years after publishing our first webcomic page online, we now have our first 80 pages book printed, published by Studio Lounak. It is already available in bookstores, and the feedback we are getting from readers is great. So great that only a month after our first print run, we might already have to go to reprint! Since 2012, we could only work part time on this project, creating one page of art per week. Being comic book readers ourselves, we know how frustrating the wait for an upcoming issue or trade can be, that's why we want to release Far Out vol.02 as fast as possible! In order to do that, however, we need time, and that's where you guys can help. You know the drill with these - $10 gets you a digital copy of both the first and second volumes, while $20 gets you a physical copy of the second volume. $40 will get you both physical volumes bundled together. This book gathers an A-Z of various kinds of creatures designed to rip your tabletop adventurers to pieces - and the rules to generate them! A is for Android, B is for Breath Weapon, C is for Crossbreed! Game masters of any rule system will find inspiration for creating strange, new abominations: random tables of traits, powers, and lore; awe-inspiring illustrations by your favorite fantasy artists old and new; and rolling handfuls of dice on monster generation tables. 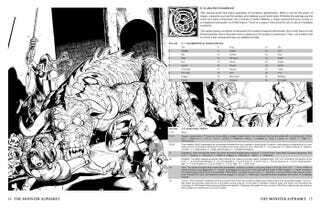 $12 will get you a PDF of either the Dungeon or Monster collection, $24 digital versions of both, and $25 the physical version of the Monster alphabet.